An amazing day--we got snow, again, I think this is the most snow we have gotten in my adult life here in Texas all in what we term as winter. Hubby is on vacation this week. Then as amazing as the snow is, I'm still in shock from bringing in the mail yesterday and clapping, you know me and my clapping thing. The fabulous magazine Just Cards! by Scrap & Stamp Arts sent me a copy of the Spring 2010 issue because they chose my Halloween card Smell My Feet to be in this issue. Yay!!!!!!!!!!!!!!!! Now, that's 2 magazines that have published 2 of my cards. I'm so excited. I'm going to have to figure out how to put some kind of I've been published box on my side bar. There may be some more excitement later and I could add to the box because I sent off 2 more packets to 2 other publications a few weeks ago, you never know. I have to let you know also about a new challenge, at least to me, Just Scraps. Jean came over and left a really nice comment on my Spring Butterfly Card and invited me to participate. This is for Challenge #2, so add Just Scraps to your lists for some more challenging fun. This card is for 3 Challenges. On the Sketch and Stash Challenge they always like for you to tell what new or stashed items you used on you projects. So, let's see, that would be the felt heart trim I've had for awhile, the red crinkly paper behind mask, I only use it in small bits, I like it so much, for some reason have trouble parting with it, and last but not least, my new Pinking Hearts border punch from Stampin Up, using the technique of running it through the crimper and oooching it around for trim. I think it made a pretty cool effect behind the mask. 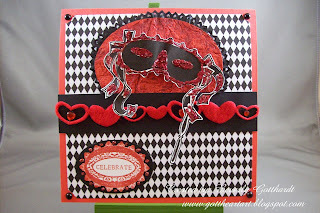 Supplies: Red 5 1/2" Square card, Papers: Me&My Big Ideas Bright Coordinates Paper Pad, Stampin Up-Black, Whisper White, red crinkly unknown, Stamps: Fiskars-Cameo Ovations, Mask from PrintMaster 11, Ink: Stampin Up-Ruby Red, Recollections-heart trim, Sulyn red Xtra fine glitter, Amy's Glittering Glue, Suze Weinberg's Pure Glittere-ruby slippers, Recollections-pearl and rhinestone stickers, Stampin Up-Pinking Hearts border punch, Fiskars crimper, Fiskars shape cutter templates-Ovals-1, pop dots. Fabulous card. I love the mask and great colour combo. Thank you for joining in the Sketch and Stash this time. What a gorgeous card Beverley, I love what you did with my sketch! I love the mask, great colours. Thanks for joining in at Polkadoodles this week. Absolutely stunning! Thanks for sharing with us at TT this week! Great creation and thanks for joining us at TT this week . Gorgeous card! I love the stylish design! Magical card great part feel love all the elements you have used. Congratulations on being published again and good luck with the others things you sent out. Thank you for joining in with us at TT this week. a great project love the mask and the strong background. Thanks for joining in with a difficult project with such a great entry.